The above menu, sourced here in Australian state library archives, illustrates fusion cuisine before the term was known. In further posts we will examine some of the other menus featured in this link, particularly of wine and food clubs. 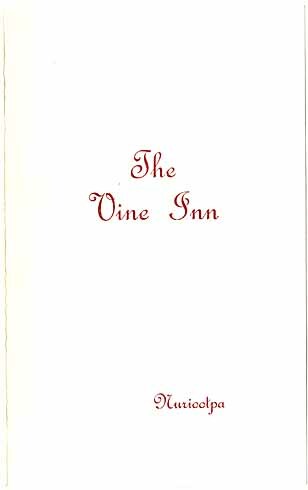 The Vine Inn is a long-standing institution in South Australia, in Nuriootpa about an hour’s drive north of Adelaide. This menu dates from November 1956 and features as a main course steak and kidney pudding, sauerkraut, green beans, and tomato. It’s a dizzying exhibition of disparate culinary elements. The appetizer is spaghetti on toast, a starchy combination with probably no direct Italian origin. As a U.K. supper or nursery dish it is well-known, also in certain areas of former U.K. influence. Australia is a prime example but a little birdie told me our Newfoundlanders like it too. So you have food elements here of English, German, and quasi-Italian origin. The desserts are more typically local, except the Christmas pudding, although the style of preparation, fruit simply with cream, is English really, as are biscuits with cheese to follow. Do you know what Barossa Canneries was? Barossa had a vibrant fruit and canning industry from the 1930s until quite recently, and vestiges yet remain. “Barossa Canneries” likely meant the desserts were made with fruit canned or dried by this large business. Alternatively, if the fruit was fresh – theoretically possible in Australia’s climate – maybe “Barossa Canneries” meant that a selection of conserved or dried fruit was also available. But sauerkraut? Some Australian social history: the Barossa area had a large element of German settlement, much of it from Silesia. The sauerkraut was a modest but lingering manifestation of that heritage. Given Australia’s isolation and the fact that only some 100 years had passed since settlement days, why were more dishes not represented with a Germanic stamp? The answer is given by Angela Heuzenroeder in her informative and lively study, Barossa Food. By the year in question two world wars had dampened enthusiasm for frank exhibitions of German culture. And (my take): a hotel, as an “official” kind of presence in a community, might be expected to hew to societal expectations (norms) more than a family-owned restaurant or of course the family hearth. This applies even more to the Vine Inn as it was and is (it still flourishes) community-owned in a rather unique cooperative arrangement. 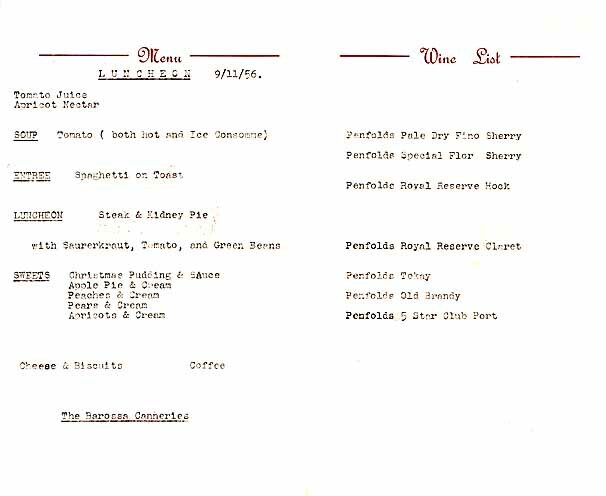 The bistro menu at the current Vine Inn offers many more choices than the 1956 version. But interestingly, Italian food is still present. So is German eating, now more fulsomely represented by different schnitzels and a stuffed Heidelberg chicken. With the years passing war memories receded. Dishes representative of rooted local culture slowly reasserted their former importance. Dishes of U.K. inspiration still feature including a roast of the day, fish and chips, and grilled salmon. So there is, although not to outward appearance, an essential continuity. The cultural memory is long. Habits and attitudes can change, but it takes a long time to quell them permanently. When the day comes that schnitzel disappears from the Vine Inn’s menu you will know that the global village has arrived in that part of Australia, in full flower. We are getting there, everywhere, as, turning the picture around a bit, Penfolds wine featured on the 1956 menu and today has a world reputation. Even some beer people have heard of Penfolds Grange, you know. 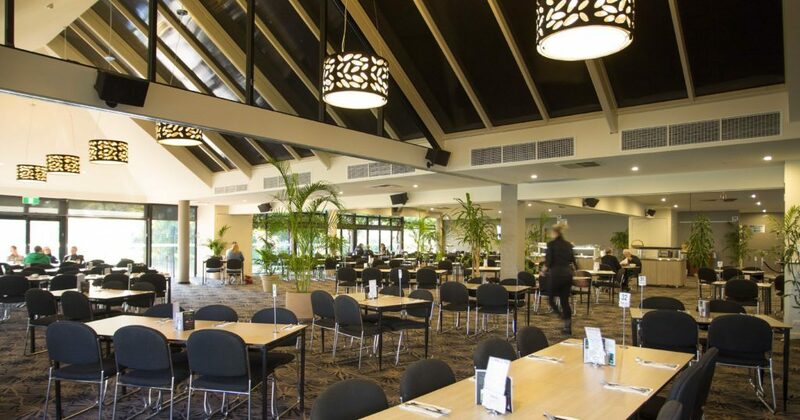 Below is the Vine’s dining room today, taken from the hotel website, here.